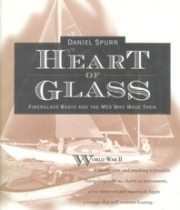 “THE BOOK” about how fiberglass became the dominant material used in building boats was written by Dan Spurr in 2000 - Heart of Glass - Fiberglass Boats and the Men Who Made Them. This is a book that took 12 years to put together. Dan is Research Editor at Good Old Boat Magazine, former editor of Practical Sailor and a former Senior Editor at Cruising World. It is required reading for anyone wanting a detailed history of how fiberglass reinforced plastic made its way into boats. This short summary is no substitute for reading Heart of Glass. While I have spoken with Dan, and he has been very helpful, I have found it challenging to get the all facts leading up to the Dolphin story. There was no one keeping detailed notes of who was doing what and when in those days, and memories are often clouded. It was made more difficult by the fact that the Sparkman & Stephens' Dolphin files had suffered from a over zealous cleaning up effort years ago, destroying a lot of the history. In the very beginning there were several people experimenting with trying to make reinforced plastic boats in the mid 1930's. Early structures were made with textile cloth as the load carrying fibers. FRP - fiber reinforced plastics was a term that really meant fiber, not fiberglass! It was not until 1941 that Owens Corning developed a process for weaving fiberglass into a cloth like material. Among the very early pioneers it seems that if one person would get the most votes for succeeding in making the first fiber, and glass, boats, that person would be Ray Greene. His story, and his indirect but very important effect on the Dolphin are covered in several places on this site. In the 1930's plastic resins had not yet been developed that would cure at room temperature, requiring large ovens to raise the temperature of molds. Resins liquefied at the higher temperature, running like water to the lowest part of the molds - causing resin rich and resin starved areas. Companies like GE developed equipment to 'rock and roll' the molds to keep the resin evenly distributed. The higher temperature caused mold materials to expand at different rates causing mating problems. The liquefied resin needed fillers to thicken it - fillers like powdered asbestos!! were used. Ovens and molds were made of wood and fires were frequent. The requirement for ovens and practical size considerations were major factors limiting early production to small boats and dinghies. Palmer Scott's Marscot Plastics, the first builder of the Dolphin 24, also produced plastic reinforced boats for the US Navy. World War II, as it did to many emerging technologies, had a major impact on the depth and breath of fiberglass technology. War planners were working hard to find durable replacements for scarce aluminum and steel. Into this mix of production challenges Palmer and others worked to solve the technical problems on the plant floor, many developing 'secret' processes and secrets they tried hard to keep from competitors. Jim (Cham) Hunt, then sales manager and later CEO of O'Day reported that Palmer Scott would not let him or other O'Day sales people into the Marscot Fall River plant for fear that his production secrets would get out. 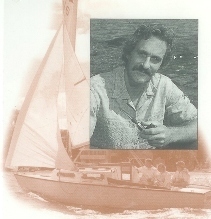 Gordon Goodwin of Cape Cod Shipbuilding in Wareham, Massachusetts, another early fiberglass boat producer, told me that his father, Les, had the same concern and did not let sales people into his plant. Despite being fierce competitors developing and commercializing this new technology, Gordon told me his father and Palmer would take the train together to Washington in the early 1940s to go to meetings that the War Department called to monitor progress and get ideas on the various programs they had going to develop fiberglass technology. Ray Greene and Palmer Scott were two of the people who were leaders in the move to fiberglass in boats. We will focus our attention on these two individuals elsewhere in this section. If you want to go there now click on their names.